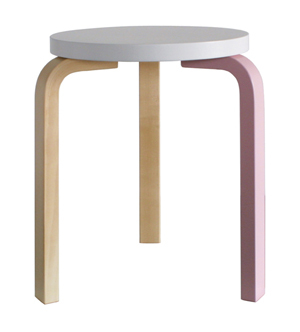 This year marks the 80th anniversary of Alvar Aalto’s Stool 60, produced by Artek, the company founded by Alvar and Aino Aalto, Maire Gullichsen and Nils-Gustav Hahl. 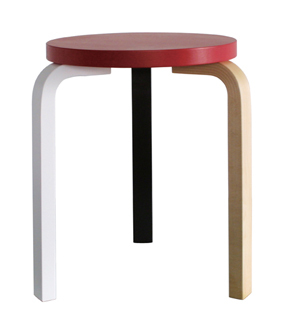 The design of the stool itself, with the use of wood instead of bent steel was revolutionary back in the 30s. It is of course durable – with Aalto repeatedly throwing the prototype of the Stool 60 to the floor at the Korhonen furniture factory in Finland. 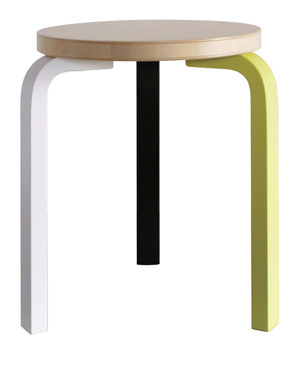 For the anniversary year, Artek released the Stool 60 Anniversary Edition designed by German designer Mike Meiré. The colors of these stools are taken directly from Aalto’s Paimio Sanatorium for tuberculosis (1928–1933): the yellow of the floors, the green of the walls, the turquoise of the handrails and walls, and the orange, white and black of the furniture. The Paimio Sanatorium, located in Paimio, Finland, is considered Aalto’s most important functionalist building and still stands today as part of the Turku University Hospital.